Newsletter: Too Many Things Happening With Apple! The new SDK will allow developers and advanced users to create new AR apps and utilities without hardware upgrades. Ever since Pokemon Go became a hit, applications based on Augmented Reality are quite in demand. We already know that Apple recently released their ARkit for developers to create new and innovative AR based applications. But Google surely doesn’t want Android users to lose any of the Augmented Reality fun and have also revealed their own ARCore SDK. IS IT A FULLY CAPABLE SELF DEV KIT? When compared to Apple’s ARkit that has been around since July, Google’s ARCore is currently only offered on their flagship Pixel smartphone. As Pixel runs the latest Android Oreo operating system that means this kit will be available on subsequent smartphone releases that operate on Google’s newest platform. Moreover, there are also reports of Google preparing to launch AR apps for desktops with a new browser. WILL IT AFFECT APPLE IN ANY WAY? Although Google releasing an AR self-development kit won’t have any direct impact on upcoming Apple products, they sure might provide added power to Android devices. Additionally, users should not expect a full release till later this year making it a negligible threat to the upcoming iPhone 8 that is reported to be AR ready. Google ARCore however, currently offers 3 main modules namely, motion tracking, environmental understanding and light detection. With these Google has also made it clear that they target this technology to be featured on more than 100 million devices by the time this preview ends. South Korean tech-giant release latest competitor to Apple Watch smartwatch today in Berlin. While Samsung is not really a new player when it comes to wearables, their older 2013 Galaxy Gear was considered as one of the first examples of this technology. That however, couldn’t really usurp Apple Smartwatch from becoming a premium brand. 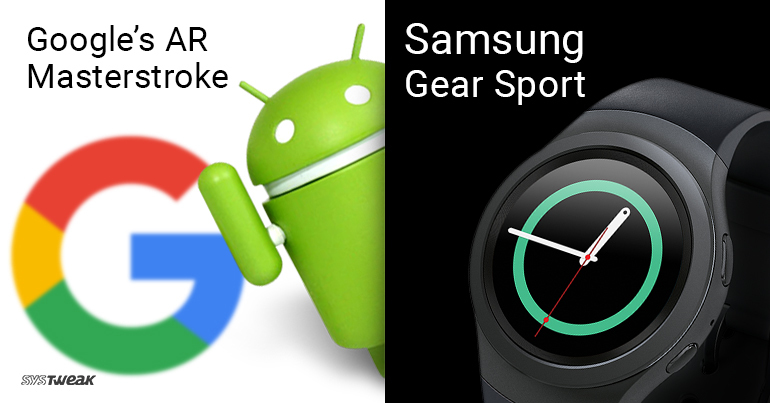 But that is about to change as Samsung will reveal their latest smartwatch, rumored to be named as ‘Gear Sport’. OK, BUT WHAT IS DIFFERENT ABOUT THIS WATCH? Despite fitness bands and smartwatches becoming extremely popular and common among tech users, Samsung Gear Sport hopes to replace traditional wristwatches. It comes embedded with a dual-core processor and 1GB RAM. It will also run on a brand new platform called Tizen 3.0 and allows quick data transfer via WiFi or bluetooth. BUT WILL THEY BE ABLE TO OUTSELL APPLE? Simply putting the same features as competition certainly won’t help with Gear Sports sales. Hence we might have to wait for reviews on its performance against Apple Watch. Older Samsung smartwatches do not offer the same level of slick experience as Apple and we surely want to see another great smartwatch that could keep the upcoming Apple Watch series 3 in check.